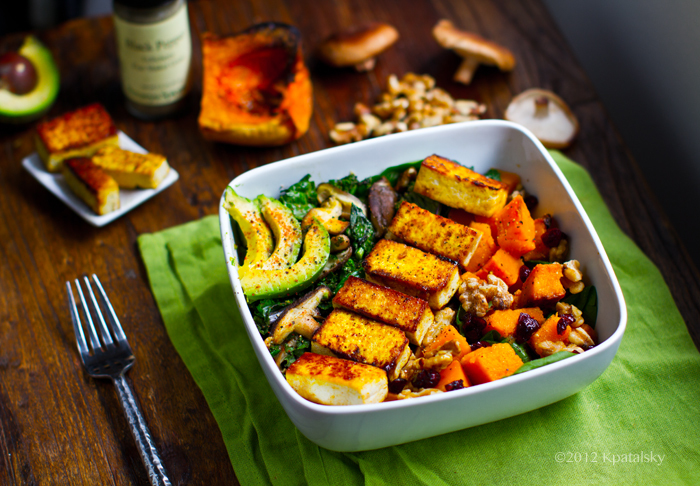 This Butternut Bliss Fall Salad is a healthy-delicious vegan meal for fall!.. And check out the nutritional info - this bowl is loaded with protein, vitamins A and C, calcium, potassium, omega-3 fatty acids and more.. It always boggles my mind when people non-chalantly say "I hate salads." Or when they are ordering dinner at a restaurant and say "I should probably order a salad too, I guess." or the worst one.. "Maybe I will just have a salad." ..JUST have a salad? Salads are not "just" salads. Or at least MY salads are never just salads. Salads really are one of my favorite meals! I crave them. They make me feel good. They make me happy! So hearing someone say they will "just" have a salad sounds kinda like.. "Maybe I'll JUST have a slice of double chocolate fudge cake." So yes. I am a proud salad lover. 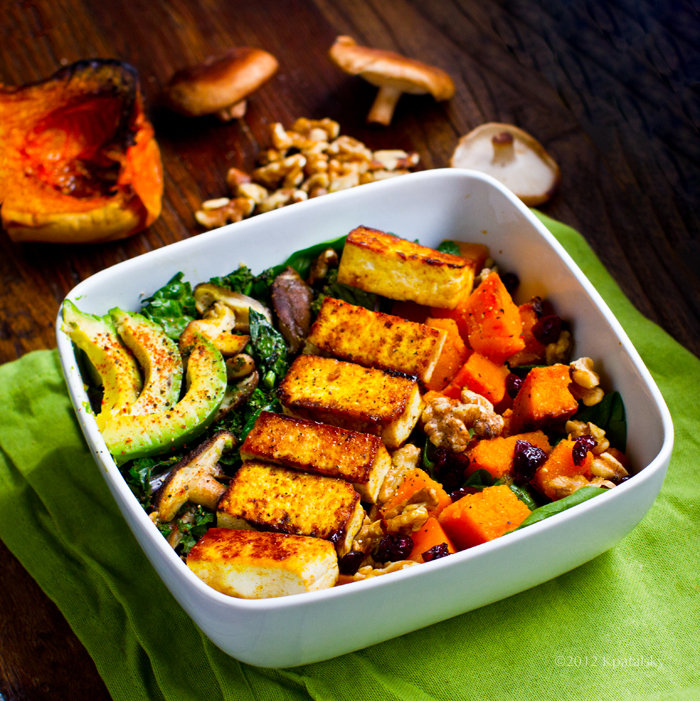 And every season deserves a few go-to salad bowls. 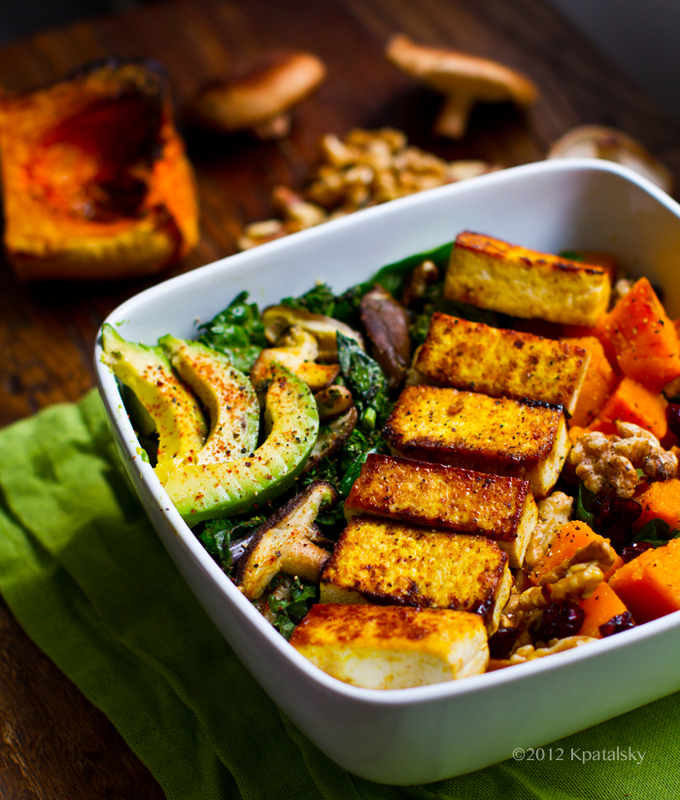 Make your salad into a meal by adding grains, beans and bean-based foods like tofu and tempeh, roasted veggies, nuts, seeds, fruit and more. 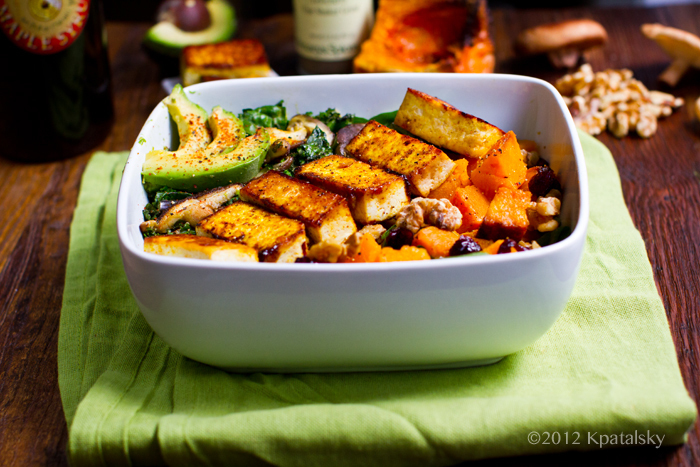 avocado, rich in healthy fats..
butternut squash, roasted until sweet and tender. walnuts too..
Also rich in potassium, magnesium, manganese and selenium. I hope you enjoy this blissful (super food infused) recipe..
1. SQUASH. Roast the squash. You can do this 1-2 hours ahead of time, or you can do it the night before if you'd like chilled butternut squash cubes on your salad. Your choice. Turn the oven to 400 degrees. Slice oven your squash into long halves, clean out the seeds. 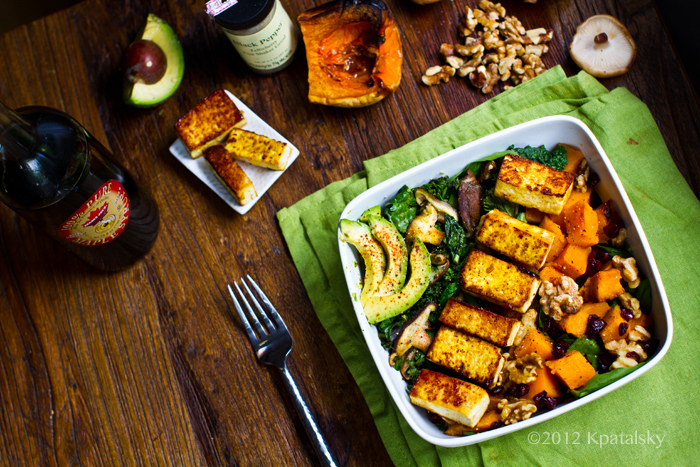 Brush some oil, drizzle of maple syrup and pinch of salt over the squash. Place on a baking sheet, face up, and roast for about one hour or until tender and caramelized. Remove from oven and cool well before handling. Slice into cubes for the salad. 2. TOFU. 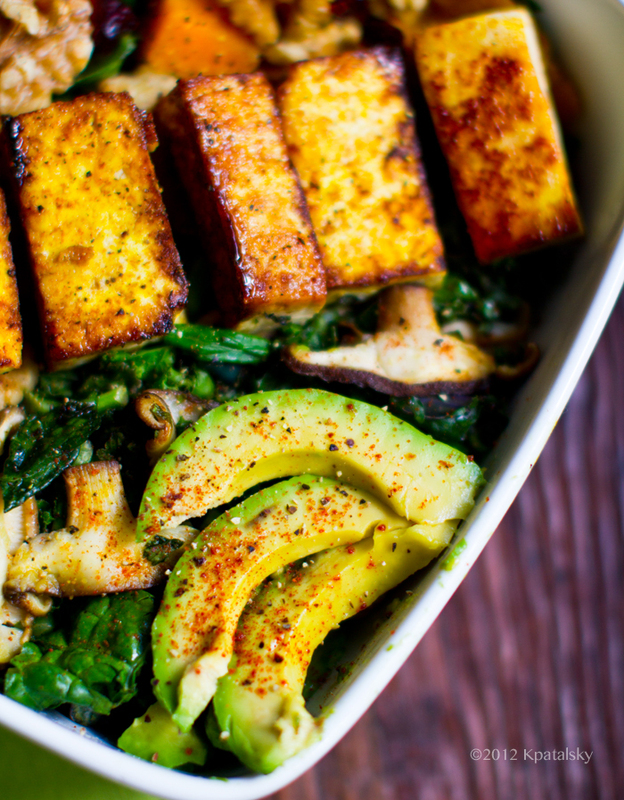 Prep the tofu by squeezing it dry with a paper towel and slicing into rectangles or cubes. Warm a saute pan to high heat and add some oil to the pan. Add in the tofu, maple syrup and spices over top. Cook for bout 2-3 minutes on each side, or until the edges begin to brown and crisp. Remove from pan and set aside. 3. GREENS. 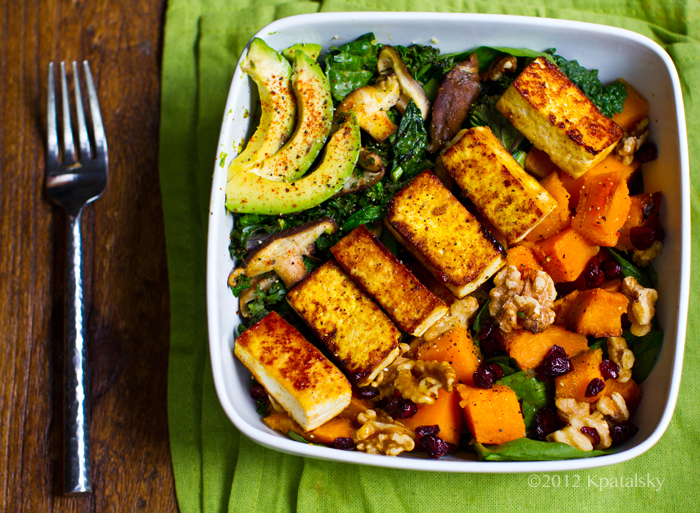 Add the kale greens to the tofu saute pan (after tofu has been removed.) Add a drizzle of oil if you'd like. Turn heat to medium and wilt the greens until tender. Add in the lemon juice to speed up this process. Transfer the greens to your serving bowl. You can also add in the fresh baby spinach greens alongside. 3. SHROOMS. Add the sliced shiitakes to the same pan and saute them until tender. Again, using as much or as little oil as you'd like. I just added in the tamari to de-glaze the pan and create some steam and that was enough cooking liquid for me. Transfer cooked mushrooms to your salad bowl. 4. 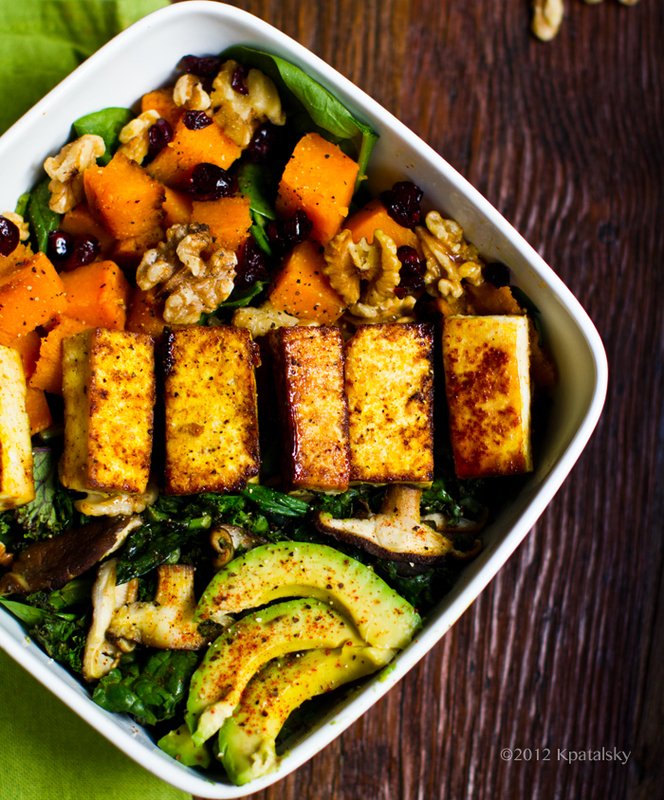 Continue assembling your salad by adding the tofu, butternut squash cubes, walnuts, dried cranberries and sliced avocado over top. Drizzle the dressing over top as desired. Serve while components are still warm. More Salad Chatter. 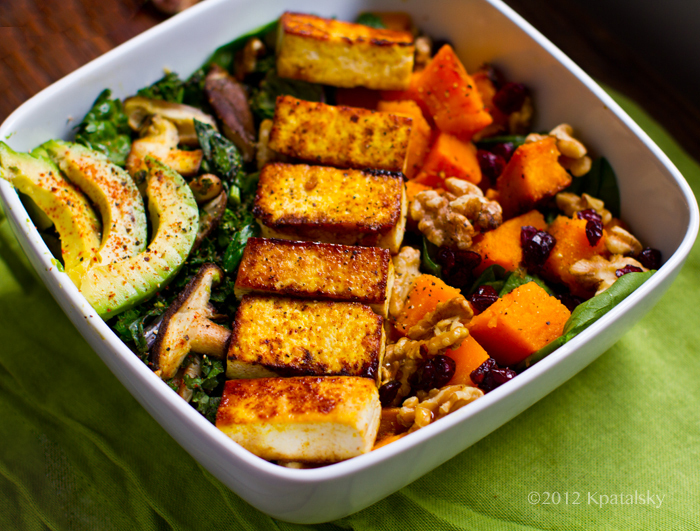 I love creating salads that pair up contrasting ingredients. Hot with cold. Salty with sweet. Spicy with cool. Perky with mellow. This way my salad is suddenly popping with personality, complexity and fun. To me, a salad is definitely more than just a side dish. And I am passionate about this fact! 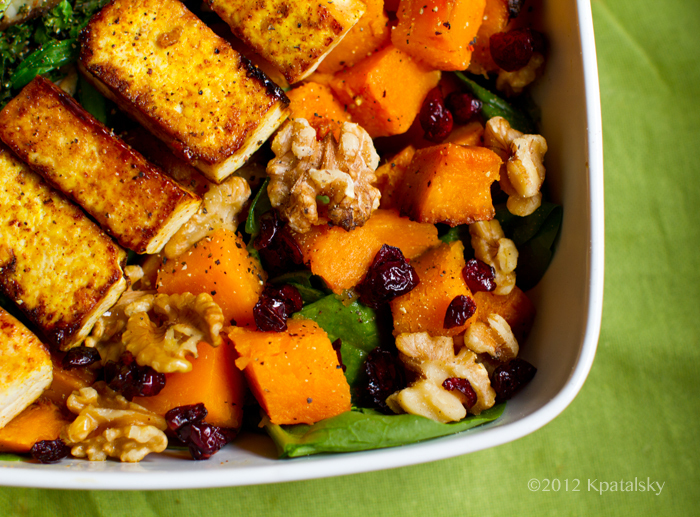 How do YOU make your salads shine and become worthy of ogling eyes and growling tummies?? ?